Today for #WeekdaySupper we are celebrating beef! Ohhh, I love a nice tender steak or my all time favorite a hamburger. But today I have for you a simple weeknight dinner that will sure to please the palate and beef lovers of all kinds. 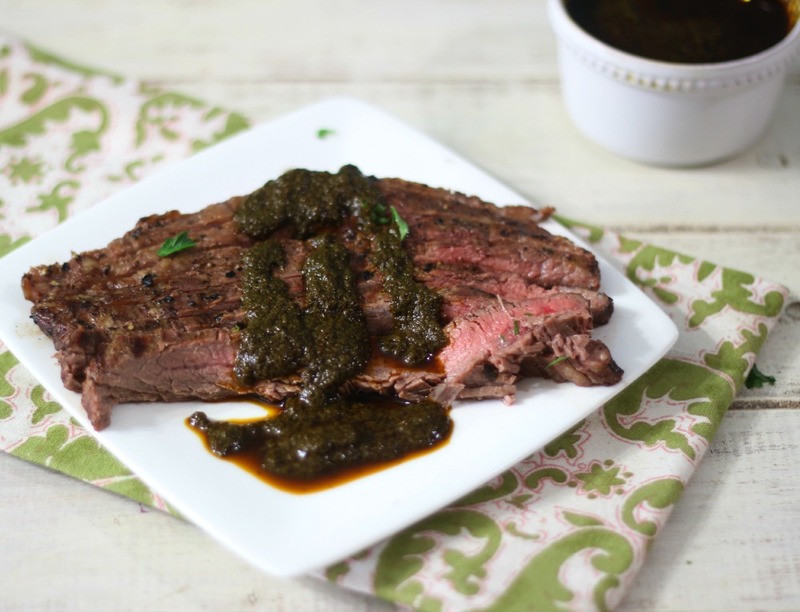 Today I am sharing with you my Flank Steak with Spicy Chimichurri Sauce. For my recipe I used one of my favorite kinds of beef, flank steak. What I love about flank steak is how fast it cooks and how tender it can be. It’s perfect for adding to sandwiches or tacos, but we decided to eat it on its own with a side of brown rice and a salad. 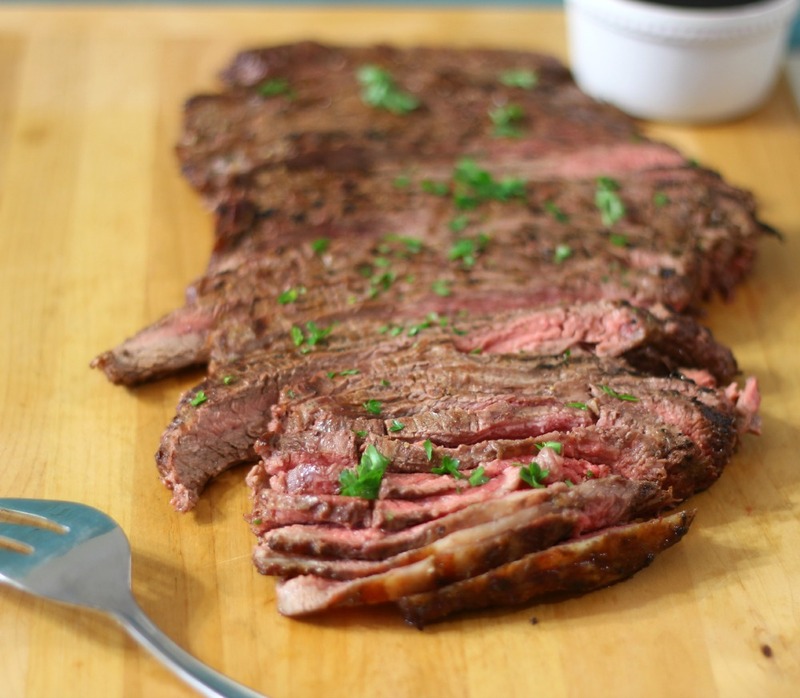 The key thing to cooking flank steak is cooking it for about 5 minutes per side, then letting it rest for 5 minutes. I guarantee you will have a tender, juicy steak. I topped my steak with a nice simple, slightly spicy chimichurri sauce that I whipped together in a matter of 5 minutes. It’s made with parsley, red wine vinegar, garlic, olive oil, smoked paprika and my favorite chipotle in adobo sauce. It’s not supper spicy, but it does have a nice kick of heat. Let flank steak sit out to room temperature, about 20 minutes. In a blender or food processor, add parsley, garlic cloves, olive oil, red wine, chipotle in adobo, smoked paprika and red peppers. Process until blended. 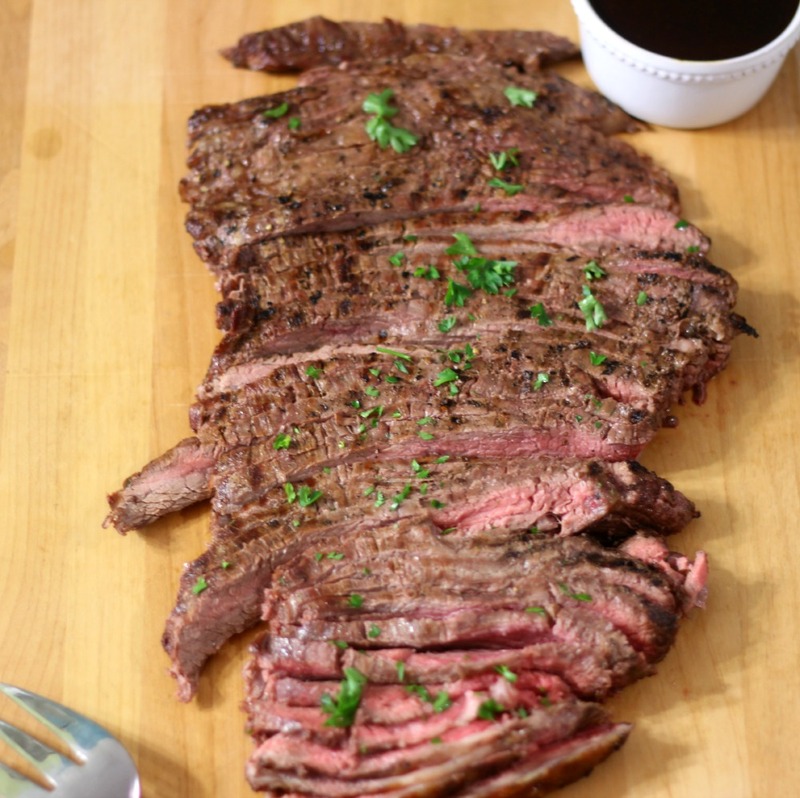 Place flank steak on grill and cook each side for 5 minutes. Take off the grill and let it rest for 5 minutes. Cut thinly against the grain, sprinkle with parsley if desired and serve with chimichurri sauce. Note: You can make the chimichurri sauce in advance. I love my dinner tonight! Plus I love that you can make the chimichurri sauce in advance, plus the steak cooks so quickly. Now you can have a gourmet dinner in a matter of minutes. I highly recommend checking out the Beef Pintrest Board for some more great recipes. You can go here! You can also find The Beef Checkoff at the following places. Make sure you check out what the rest of the gang from #WeekdaySupper made with beef. There are so many cuts of beef and it is so versatile, that I can’t wait to try out the other recipes. Afterall I can always use more beef recipes. I love how you added a spicy flare to chimichurri sauce! I’m ready to fire up the grill and make this soon. Ha Ha! Thank you Renee! I love the added hint of spice to the sauce. I love flank steak and your looks divine. The added heat is just perfect!! Thank you Tara! You know I like my spicy food. I rarely cook steak but I definitely am inspired to now.. this flank steak looks totally delicious and jam packed with flavour, especially with the added chimichurri sauce! 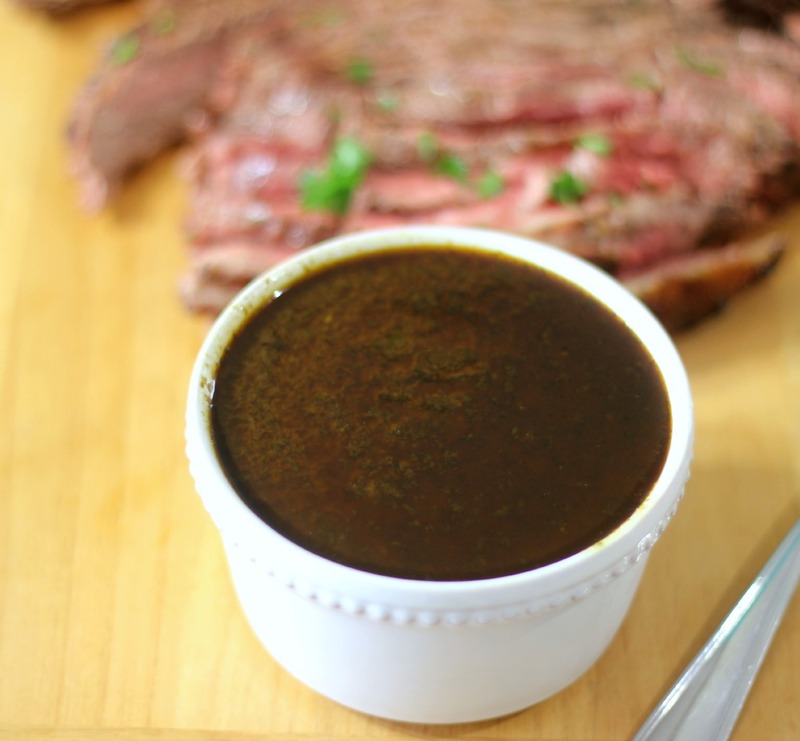 What a great change from regular steak sauce!